A radiant bridal ring set from top-to-toe. Both rings are beautifully created in platinum and adorned with dashing diamonds. The engagement ring features as the statement piece, showcasing a stunning radiant cut diamond centre surrounded by a double halo featuring smaller brilliant and baguette diamonds. 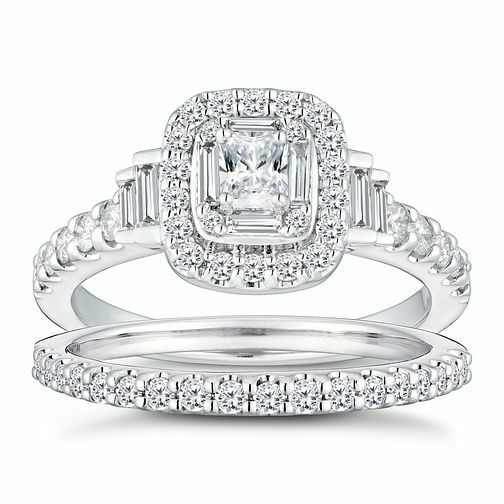 The total diamond weight for this bridal set is 1ct. Platinum 1ct Diamond Radiant Baguette Bridal Ring Set is rated 4.5 out of 5 by 2. Rated 5 out of 5 by Anonymous from Beautiful design Purchased this ring set for my wife. She loves the design and the fact that there are differently shaped stones which make it a little more unusual than all being a single shape. Rated 4 out of 5 by Anonymous from Perfect bridal set Wow this such a beautiful set. Myself and husband chose it together as an upgrade for my rings. You won’t be disappointed with this stunning bridal set. The picture does not do it justice! This is definitely a show stopper. Absolutely perfect I love it ! !